Here’s a ”quick” story about a dentist and his impact in Lesotho. During the same week that Reclaimed Project had the large team from Mississippi (read all about that here), Jim and Teresa hosted a medical team that came with many healthcare professionals. One member of their team, who turned out to be a lifesaver, was a dentist named Dr. Leon. He, along with his assistant Mrs. Brenda, was gracious enough to see one of our friends who badly needed dental work done. Tsiliso (See-Dee-So), one of the boys from Khokhoba Care Center, had multiple baby teeth that had decayed and were making it difficult for his adult teeth to grow in correctly. On Wednesday, the medical team set up their mobile clinic in the village of Ha Saui (about 45 minutes away from our home in Katse). We arrived early in the morning and tried hard to keep Tsiliso calm while we waited for the clinic stations to be set up. Beth kept Tsiliso busy in one roundavel (Basotho home) by drawing with him. Well, that was the calm before the storm. On the way to the dentist’s roundavel, Tsiliso walked with newfound, “big boy” confidence. But, as soon as we got to the doorway and he saw the dentist’s chair, Tsiiliso lost his mind. He was not having it. We had him sit in someone’s lap for the procedure. MeMookho pinned down his arms and two other men were holding his feet incase he started kicking. I even covered the poor boy’s eyes so he couldn’t see the tools going into his mouth. Some parts were calmer than others, but Dr. Leon and Mrs. Brenda deserve so much credit for putting up with all the yelling and thrashing without becoming discouraged and giving up. There was a lot of tears, yelling, squirming, and even biting. Dr. Leon said it was the hardest he had ever been bitten (I am still so sorry, Dr. Leon). It was quite the experience! In the end, Tsiliso got 6 teeth pulled! He was a trooper and did great considering the circumstances. But the true stars of the day were Dr. Leon, Mrs. Brenda, and all the helpers in the room. I think Teresa’s pep-talk gave him a false sense of strength. I was thankful that Ntate Molapo didn’t take him too seriously and was able to laugh it off. MeMookho, however, began crying from laughing so hard. With a few struggles, our boy made it through and Dr. Leon pulled numerous baby teeth that had begun decaying. Afterwards, Tsiliso and I went to show Teresa his teeth and he was so proud that he’d survived. The two of us sat outside for him to relax a minute after the traumatizing ordeal. It was a really special moment for me. He kept feeling his numb lips and cheeks with his fingers and trying to talk to me in Sesotho. It’s not usual for Tsiliso to sit still and let me wrap my arms around him, but this day he was craving some TLC, and I was soaking in every minute of it. After Tsiliso had recovered for a while, we packed everyone up and headed back to Katse. Leaving that day, I felt so thankful for Dr. Leon, Mrs. Brenda, and the Floras, for letting us come to the clinic and caring for our boy. We took Tsiliso to the women at the Care Center who kept an eye on him for the rest of the day. Despite a few periods of crying, he was his happy self soon enough, telling everyone about his morning and how excited he was to get rid of his baby teeth. We thought that would be our last time with the dentist, but the very next day Tseko (Say-Ko), from Khohlo-Ntso Care Center, came to the Center with a swollen cheek and complaining of his tooth hurting. He had skipped school that day because of the pain and wasn’t playing with the other kids. A couple times during the afternoon, he even started crying because the pain was just too much for him. Tseko is on of our littlest boys at the Center. He is still working on counting but will surprise you with what he will say in English. My favorite quote from helping him with his numbers is that 40 is said, “forty zero.” The struggle is real. This boy has the sweetest heart and loves to drive in Tyler’s lap. The pictures above were taken one day apart! You can see how big the swelling was and it came on so fast. We called Teresa to see if the dentist could see him. God truly has a plan and always has His hand in everything. At first, I was so upset because we went to the dentist the day before, why couldn’t we have known about Tseko’s mouth then so he could have gone to see the dentist on the same day as Tsiliso? Tyler and Beth quickly helped me see that it was a blessing that the dentist was still here and able to see him. Just two days later and they would have been gone. Teresa said it wouldn’t be a problem and we planned for Dr. Leon and Mrs. Brenda to come and take a look at Tseko’s mouth after they returned from a full clinic day in the Matsuko Valley. I felt bad, knowing how tired they must have been after the long day. They seemed happy to help though, and we were very thankful. We went by Tseko’s house and told his caretaker the plan. Of course, his caretaker didn’t seem to mind at all and was fine for him to go with us. Because the Spring Break team was here, we had dinner at the lodge and brought Tseko with us. Although you could tell he was in pain, he loved being at the lodge. He was mesmerized by the TV and just kept pointing at it. We finally had to pull him to the dining area to eat and he very carefully chewed his food on one side of his mouth. While he was eating, a can of Coke caught his eye and he decided he needed one too. We kindly said no, and showed him how we were all drinking water. Immediately, he got up from his chair and walked over to someone from the team. This young man had befriended Tseko and had been playing with him all week. Rumor is, Tseko had just tried Coke for the very first time because someone from the team of guys doing construction gave him one to drink. He went to his friend and asked him for a Coke, which he immediately got. That little stinker. He knew how to get what he wanted! We finished with dinner and got an update from Teresa. Dr. Leon and Mrs. Brenda were almost back to Katse and would come and see Tseko after they had finished eating dinner at the Flora’s. While the team had debrief, Beth and I brought Tseko (with Coke in hand) to our house. It was around 7:30 by now, and because he loved the TV at the lodge (which was just the boring news) we wanted to show him a movie. We put on Toy Story and he was instantly glued to the screen. In the middle of the movie, he stood up and went to the front door. I asked him if he needed to use the toilet, to which he just stared at me (he only knows a little English). I brought him over to our bathroom and showed him the toilet. He looked at it with a confused look, turned around, and went out the front door. Beth and I looked at each other and laughed quietly. I really don’t know if he has ever used an indoor toilet before. He came back inside and continued watching the movie. After some time, he fell asleep. After seeing the time, we decided Tseko would just spend the night with Tyler and I in our spare bedroom. We called MeManeo, who sent a message to his caretaker so she wouldn’t be alarmed when he didn’t return on time. Eventually, Dr. Leon and Mrs. Brenda came over to our house and started setting up their equipment. Around that same time Tyler and Ashton came back after finishing with the team. Tseko was still sleeping as we slid him onto the lounge chair they used as a dentist’s chair. We tried stirring him so he would at least be alert and wouldn’t wake up frightened. He stayed calm as he woke up in the chair with new people in the room. Each intern held one of his hands as Tyler and I stood at his feet speaking the little Sesotho we knew to him. He was so brave the whole time. There were a couple of times as the lidocaine wore off that he would squeeze the intern’s hands and his legs would begin to shake as a tear fell down his cheek. My heart broke to see him in pain but yet so brave. After pulling numerous teeth, Tseko climbed into Tyler’s lap and curled up onto his chest. Dr. Leon and Mrs. Brenda cleaned and collected all their supplies and headed home for a well-deserved night’s sleep. The interns stayed and talked for a few minutes and then went home as well. Within 20 minutes, Tyler and Tseko were both asleep in the chair. I had the spare bed ready for Tseko but couldn’t stand to wake him. I laid down on the couch and fell asleep watching Tyler hold Tseko with so much care and affection. Tyler and I woke up every time Tseko stirred, coughed, or breathed. About 3am, Tseko stirred enough to wake himself up and we took this opportunity to tuck him into the spare bed. Worried he may wake up needing to go outside (because of how opposed he was to the toilet), I slept the rest of the night on the couch so I would wake up if I heard him trying to go outside. We all slept soundly until the morning. Tseko got up and immediately went outside. After using the “toilet”, he just sat on our front steps and felt his cheek. The sweet boy. I had him come inside, sit on the couch, and wrap up in a blanket. He picked the Coke can up from the table. As he felt that it was empty, he had the most concerned and worried look on his face. He seemed even more concerned than the night before when he was having teeth pulled! I quickly realized what he thought and took him to the kitchen, where I had put his full can of Coke in the fridge. He was so relieved, and held it close for the rest of the morning. We tried to scrounge up some of my small clothes for him to wear because he had bloody drool stains on his shirt and his pants had “gotten wet during the night.” He wasn’t having any of my clothes, and I was feeling bad just thinking about him staying in those dirty, wet clothes all day. Tyler asked Seth O’Nan, one of the leaders of the team, who had brought his son, Ryder, if they had any extra clothes that Tseko could borrow. Thankfully, Ryder saved the day! They brought him a whole outfit, even new socks! Tseko was so excited! He said the socks were his favorite part. Although for the next few weeks he wore his new shirt every single day. After breakfast, Tseko got a ride back to Khohlo-Ntso with the guys (without even telling me bye). I was kinda sad. I had really enjoyed having him in our home and looking after him. It was a special night for Tyler and I both. Later, when I made it out to that side, MeManeo told me Tseko was so happy when he arrived back home and he even told her that he wanted to be sick again (so he could come back to our house). My heart was so happy hearing that. We joked with Dr. Leon about how different our two boys were. That one wouldn’t sit still for anything and the other was practically asleep the whole time. Dr. Leon and Mrs. Brenda were fantastic and showed us so much love by helping our boys so much. We want to send a big thank you to Dr. Leon, Mrs. Brenda, and Jim and Teresa for being so willing to help and serving our children with a Christ-like heart! And to show Dr. Leon and Mrs. Brenda that we have scared the kids into brushing their teeth everyday! Although, there is a part of us that worries Tseko has told the other kids that you get to watch TV and drink a Coke if your teeth hurt. Every Friday we give out food packs for each child and their caretakers to eat over the weekend. We started our day by picking up all the mealie, beans, soya mince, milk, and cookies for the packs. The construction on Khohlo-Ntso Care Center’s “big house” is almost finished. All they need now are the doors to be installed and to have glass put in the last two windows. We went over this morning to prime the walls. Tyler, Ashton, Beth, and I spent almost five hours painting the newly finished cement walls. You could tell we had been working hard just by looking at us, the rollers splattered paint all over our hands, clothes, and faces! We got about a coat and a half painted before we ran out of primer. We will have to pick up some more when we are down in Johannesburg before we can continue the project. That’s one negative of living so far away from civilization, when something runs out, you have to wait until the next planned trip to restock. All morning the sky was ominous and we could tell it was going to storm. Throughout the morning it had rained and hailed. Then the sun came out briefly, just before it rained and hailed some more. By early afternoon (right as the paint ran out), we began packing things up and noticed the sky above the nearby valley. Dark, dark, dark. We picked up the pace and said our goodbyes to the women and the few children that had arrived from school. As the four of us carried everything back to the car, we turned around and saw white coming from the black clouds. We put the two Care Center doors (Tyler needs to trim them with a power saw at home because there’s no power at this Care Center), paint cans, and all our other supplies in the car. We felt the coldest wind imaginable, and the anticipation of what was coming was very exciting! As Ashton got in her side of the car, Releboghile, a young man from the church who was working with us (and speaks great English), jumped in as well, forcing Ashton into the middle seat and under the doors. He wanted a ride to a nearby village and we were all in such a hurry to get to the car that we probably didn’t hear him ask for a lift. Ashton now couldn’t sit up; she was hunched over with her head leaning on Beth’s shoulder. Mind you, Beth and I were both hugging the windows on our side because the door was on top of all the head rests. Tyler was hunched over with his head just above the steering wheel. As we got to the road, it began sleeting! We had made it to the car in just enough time. We laughed as we realized how uncomfortable the 20-30 minute ride would be for all of us. Then, we all had the same thought at the same time – our kids! Only a few kiddos were at Khohlo-Ntso when we left, which meant that more were either in route or decided to go straight home. We passed one child heading towards the Center and told her to run (mata)! We made it past the school where we thought we would see many of our Khokhoba kids, but no one was there. Mind you, the freezing rain was coming down harder and harder each minute. We kept going, and found Tsepo (11 year old girl) walking by herself. She jumped into Beth’s lap and said two of our boys were just ahead of her. We found them further on the road and they got into the back (barely). We had a suitcase of donated clothes, two boxes of car parts, the food packs for Khokhoba Care Center, and don’t forget about the two doors overhead. Knowing there are many more kids who would need a lift, we kept looking all around for them. Each time we drove around a turn we would see someone else and cram them in! In the end, we had fourteen people stuffed in our car. Honestly, that isn’t abnormal for us, but add in the two doors and the trunk full of stuff it was quite comical. Beth, Tyler (the driver who was already hunched over because of the door), Releboghile, and I all had a child in our laps and there were five in the back! We got all of them to the Center where the women were huddled around the propane heater. We made a plan for them to eat quickly so we could take everyone home before it got worse. The four of us ran home for a quick, very late, lunch and then I went out to take the kids from MeMookho’s village home (4 kids) while the interns took the kids from MeMaselebeli’s village home (5 kids). The rest of the kids live in the village the Center is in and don’t need rides (although they asked if we could drive them up to their homes today). Next, MeMatumisang and I waited at the high school for one of our girls. He grandfather passed away and she wanted to be home this weekend for the funeral. We had planned to drive her home (25 minute drive) even though the teacher said she could walk. I told the teacher I wanted to spoil her and that God has blessed us with this car, so the least we can do is drive our children where they need to go. We got on the road headed back to Khohlo-Ntso and we started to see snow! Today is the first snow of winter in Lesotho. I dropped MeMatumisang off and then kept going to the house where our high school girl’s grandmother lives. When I was at her turn, I saw one of our little boys walking with his food pack on his head, wearing thin, torn up capris and sandals. He jumped in our car and we brushed all the snow off his coat. By the looks of the sky this morning when he was going to school, maybe he didn’t realize it was going to snow. I know he has warmer shoes and pants. Kids. I got both of these kiddos home and got back on the main road to find MeMabataung (another Care Center worker from Khohlo-Ntso) waving her hands for me to stop. She needed a ride to a village that I would pass on my way home and I was happy to have the company. The snow had picked up and the roads were getting a nice covering. Her and I spoke in broken English about how cold it was and how beautiful it was to see the snow. In just about 20 minutes, I was amazed at how bad the roads had gotten. I was thankful this was my trip home, and not my trip out. And, I was especially thankful that all our kids were home and hopefully warm and dry. Joy like a child out of school on a snow day. Thankfulness for the vehicle, home, job, and husband the Lord has blessed me with. Worry for our kids on this cold, wet night. And sadness that walking miles in the snow are normal for many Basotho. Please pray for our kids tonight to stay warm, dry, and healthy. 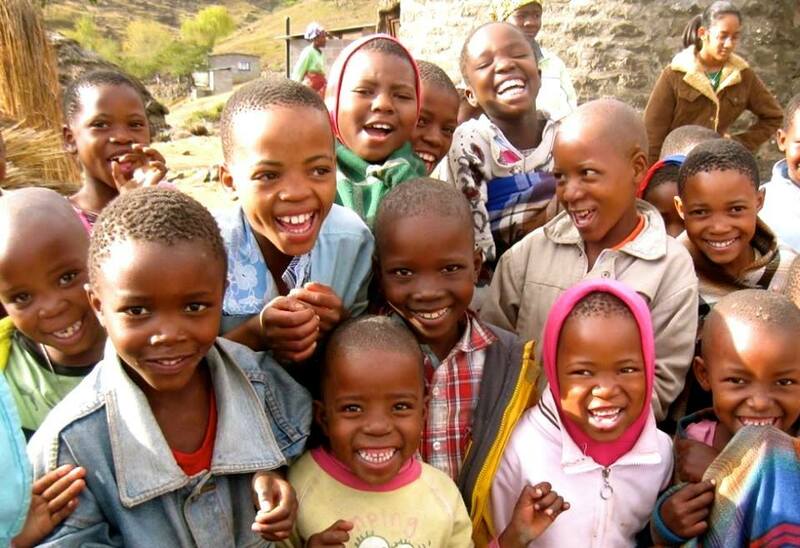 Check out this awesome video all about the kiddos in Lesotho! It’s all about their dreams for the future. According to this video, Lesotho will be a very well protected country when these kids grow up! Spring break was a crazy week! We, along with Brett, Allison, Ashton and Beth (our interns), hosted a team of almost 50 people from Starkville, Mississippi. The Kappa Sigma fraternity from Mississippi State University brought over about 35 guys to work on construction projects at each Care Center. Along with the fraternity, Pinelake (a Church in Starkville) brought a team of 10 college girls to help with job creation, orphan care, and evangelism. The team arrived late Sunday night. Because there were so many people, we rented out Katse Lodge for all the team’s rooms and meals. It was a huge blessing to have all the meals catered for the team and not to have to cook for 50 people on our own! We had a few minutes of orientation and gave a quick rundown of what the week was going to look like before turning in for the night. My group planned to do a home visit first thing Monday morning. We met up with Memaneo and Memabataung (from Khohlo-Ntso) and made our way to the Valley. Some of the group went to visit Thabiso’s grandmother, and the rest of the group went to a neighbor’s house. I went with the group to visit Thabiso’s grandmother. Mady shared “The 2 Kingdoms” and did a fantastic job explaining the Gospel. Sitting on the dirt floor and hearing the Gospel being proclaimed to an elderly woman who cares for one of our youngest boys gave me chills. Then, each of us shared scripture verses with her and she expressed great gratitude to us all for coming to visit. The other half of the group had shared with a couple of Basotho nearby and one man accepted Christ! All the while, Tyler and his group of guys began laying the first concrete blocks on the newly solidified foundation. At Khohlo-Ntso, the Care Center (which had been meeting in the Church) began construction on its own building. In it they will prepare meals for the kids, store all their materials, and have plenty of space to play and learn. Every afternoon, the Pinelake girls got to go to the Care Centers and grow relationships with the children and women. My group was assigned to Khohlo-Ntso Care Center (Center that is 20 minutes away led by Memaneo) for the week. Monday the kids were pretty shy, but as the week progressed they warmed up to their new friends. The team especially loved one of our newest little guys at the Center, Auchile, the brother of Limonta. Each day the group prepared a Bible Story and craft for the kids, and a couple of the girls got to help out with the centers (English, Math, and Bible) as well. On Tuesday morning we went to the Church and had a Bible Study with the women who were making elephant crafts. We spent a few hours with them helping to fill their elephants with stuffing, and while we were there a huge rainstorm (turned hail storm) came through. When it was time for lunch, we slid our way from the church to the van, and then the van slid its way from the grass to the road. After it rains in these mountains you have to walk like your on ice to avoid slipping in the mud. It’s so slippery and the mud gets plastered to your shoes and tires, giving you zero traction. It created quite the adventure for these girls! It was also cool to be at Khohlo-Ntso with Tyler’s construction crew each day. Even though we weren’t helping, it was awesome to see the progress being made and to watch the kids as they arrived each afternoon to see the building’s walls growing a little bit taller. On Wednesday, the two girl’s groups combined and we went to a village about 45 minutes away. The Flora’s were hosting a medical team and we had a boy from the Care Center who needed some dental work done badly. The Pinelake girls had a great time playing, singing, and loving on the children of Ha Saui. A few of the girls who had interest in going into the medical field shadowed the doctor, nurses, and pharmacy workers that day. It was amazing for them to see firsthand how medical workers can volunteer their skills on the mission field. We will post another blog post soon about our experience with the dentist! On the construction site, the walls were getting higher and by the end of the day the windows were set in place and had been blocked all around. The guys were working so hard to make sure we got as much done as possible in the week. Our goal was to go from foundation (which had been completed just days before the team arrived) to completed roof. So far they were on track to accomplish the goal! At the other site, Khokhoba, they weren’t starting a new building but rather expanding the building that had been completed a few years before. This building was too small for all the Care Center’s activities and needed a bit more room. By the end of the day Wednesday, they had completed all the framing that would be required for the massive roof that would go up on Thursday and Friday. The guys were working so hard at both Centers and seeing all the plans come together was so encouraging. Thursday was a slower day for us all around. We combined forces again and joined Allison’s group of Pinelake girls as they worked with the women making bracelets for the Love Poppy jewelry line. The girls also made personalized cards to go alongside each of the kid’s Weekend Food Packs. That afternoon, we skipped English, Math, and Bible center and spent the day at the river near the church! Progress was slow at the building sites as well. The guys were hoping to start on the roofing at Khohlo-Ntso, but as the sun was starting to set they had just reached the block level they were aiming for. The roof at this location was going to be much simpler than the other side, so the boards should have just laid across the concrete blocks (at a good slope) and been wired into the walls. However, when the first board was laid across, it didn’t reach from one side to the other. It was clear that the wrong size board had been bought. No problem, just an early morning drive to the closest tuck shop (about 15 min away) in the morning would get us back on track. Friday morning we went out to visit the same people we met on Monday. The girls prepared devotions for the new believers and we went back to share “The 2 Kingdoms” with one of the women who had asked about the gospel when we were there last. The people were so happy to see the girls again and were very encouraged. Between the two days we went out to this location, four Basotho came to know the Lord! Praise God! We have plans to go back and begin discipleship lessons with these new believers soon. After we finished visiting homes in the Valley, we went to the Primary School where the kids had a day of “races”, similar to a field day in the States. We watched the races and found some of our Care Center children in the crowd. We laughed because we were the only white people in the crowd and felt like we were a distraction from the races. Everyone was staring at us. That evening before dinner, all 50 of us gathered at the river where 9 students chose to be baptized! What a wonderful time! Over the course of the week 5 guys and 4 girls felt called to profess faith in Jesus! Tyler and Brett were able to baptize the guys. It was a really awesome experience! After dinner, there was still a bit of work to do at the construction sites. The guys loaded back into the vans and took off with some lights to work under. Each site worked until the roofing was complete, despite the fact that they all had to be up before dawn to drive back to South Africa and fly home the next day. Tyler and I are so thankful for this team sacrificing their spring break to come and serve the Basotho. They accomplished so much over this week, and we can’t wait to see them next year!